Color and contrast are very important elements in the effective communication of your message. While colors tend to convey different messages or feelings, they also work in various ways to provide contrast together. Ease of reading is greatly affected by the contrast between background and foreground. The greater the contrast, the better the readability. Remember that the environment in which the sign will be displayed is another contrast factor to consider. Black sign background – lettering will stand out more than on other background colors, but the background can be overwhelming if the lettering is small. A good choice for office building signs, visually overwhelming environnments, hotel signs, indoor signs. White sign background – most effective for most color combinations; tends to absorb its environment so it is best with lower contrast lettering. A good choice for museums, offices, retail signs, hospital signs. Yellow sign background – ideal for use in busy and crowded settings; yellow with black lettering is an especially effective combination. 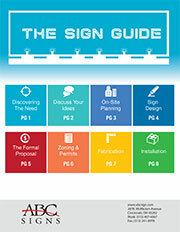 A good choice for direction signs, public signs, signs in visually cluttered environments.